Mark your calendar for April 4, 2019! 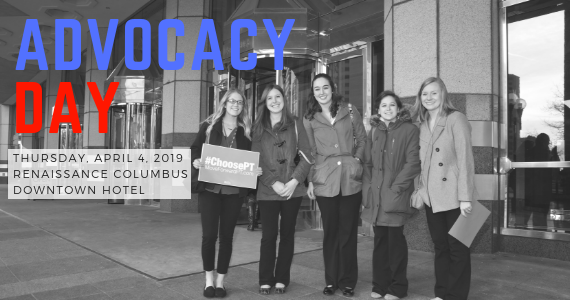 Join physical therapists, physical therapist assistants and students in attending the 2019 OPTA Advocacy Day (FREE for members)! Before registering please make sure to sign in to the OPTA website. Please plan to attend OPTA's Advocacy Day 2019 on Thursday, April 4, 2019 and make your voice heard in honor of the physical therapy profession. This event is held in conjunction with Transform 2019: OPTA's Annual Conference on Friday, April 5 and Saturday, April 6, 2019, all at the Renaissance Columbus Downtown Hotel in Columbus, Ohio. REGISTRATION CLOSES ON FRIDAY, MARCH 15! LEGISLATIVE INFO - Click here for your discussion points and let your legislator know you'll be coming to Advocacy Day! Please note, OPTA will schedule your legislative appointments for you--your personalized appointment times and locations will provided to you in advance. At OPTA's Advocacy Day, you get three things you can't get anywhere else. REGISTRATION CLOSES ON FRIDAY, MARCH 15! Networking with your fellow PT advocates from across the state on legislative visits led by experienced OPTA members. Learning the latest on current legislation and issues that impact the profession directly from OPTA's lobbyists. Crucial advocacy training from experts that you will then put into practice at scheduled, guided visits with your legislators. *All attendees should dress in business professional attire - please do not wear school polo shirts.